In the 1990s I worked for a municipal landfill. I penned a newspaper column back then entitled “Garbage Talk” and wrote stories about weird happenings at the dump. Garbage Talk appeared in print during an era before Al Gore invented the internet, before Facebook or Twitter. Yet Garbage Talk had fans. I left the industry and quit writing. Two years ago my career recycled back into managing trash. After some prodding from friends I decided to revamp Garbage Talk. The setting is the ACKNEE Landfill located in Anywhere USA. Why ACKNEE? Landfills are the pimples of American consumerism. We buy and dump stuff. But unlike a zit our landfills don’t go away. We all generate trash. Funny things happen at the dump. Like the day a coffin came in (it was empty). Or when we buried a McDonald’s restaurant. 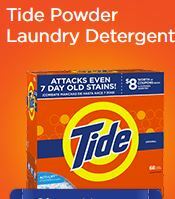 Or when the load of laundry detergent arrived, known as the day the Tide rolled in. I’ll introduce you to the guy who delivers manure every Monday and the gal who brought in a load of mannequin arms. You get the drift. Garbage Talk promotes the folks working in our trash. 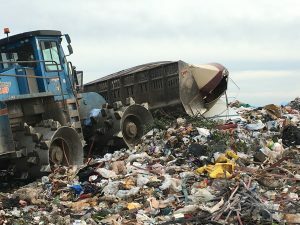 Solid waste management is the USA’s 5th most dangerous industry. My colleagues have a dirty job, and like Rodney Dangerfield they get no respect. But they have mine. That’s why I’m launching Garbage Talk. Enjoy. PS Still working on blog details, but if you’re on Facebook find Garbage Talk at Eric Miller’s Garbage Talk. This entry was posted in Garbage Talk and tagged garbage humor, landfill stories, landfills, solid waste, trash. Bookmark the permalink.